Highlights of a seminar, during which Al answers questions. Beckles treats the audience to posing – and at the age of 55 years he was in superb condition. This DVD shows 35 minutes of highlights of a seminar given in Adelaide, South Australia, during which Albert answers questions on exercise, contest preparation, diet, supplements and training. Beckles treats the audience to 5 minutes of posing – and at the age of 55 years he was in superb condition. ALBERT BECKLES – a remarkable competitor in more than 100 contests throughout his career. Albert Beckles was born in Barbados around 1930. He emigrated to London in the 1960’s where he won the 1970 NABBA Mr. Britain. 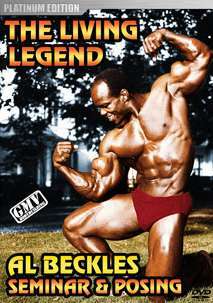 In 1971 he won the NABBA Britain again, and the AAU Mr. World. Then won his Medium Height Class in the NABBA Universe and joined the IFBB. He next won the Overall IFBB Mr Universe in Paris a week after the NABBA Universe. In 1973 he was Overall Mr. Europe before going on to a fantastic IFBB Pro career. He won the 1981 IFBB English GP, 1982 NOC, 1982 Pro World, and in 1984 it was 3 victories – the Canada Pro Cup, World Grand Prix and World Pro Championships. He won the Night of the Champion twice in New York City. 1985 it was his 2nd victory at this event. In 1991 he won the Niagara Falls Pro Invitational for his last pro victory. Albert competed in the Mr. Olympia 13 times where he placed among the top five 6 times. In 1985 he came in second to 8 times Mr. Olympia, Lee Haney. This was Al’s best ever Olympia placing.